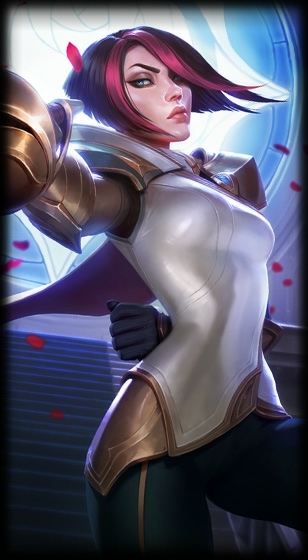 Fighting Style: Fiora uses fencing styles of fighting with a rapier, which makes her excel at one on one combat, though she can handle herself in a fight. She attacks very quickly and is a very mobile fighter. Strengths: The fought of her father increases her rage and determination, and she has been trained and self-taught in fencing and dueling for years. History: As the youngest child of the noble House Laurent, Fiora always considered herself destined for greatness. The Laurents had dominated the dueling culture of Demacia's aristocracy for centuries, and Fiora's father was regarded as one of the finest swordsmen the nation had ever seen. Inspired by his tales of glory, Fiora began training as soon as she could wield a blade and quickly showed greater talent than any of her siblings. As she grew older, her self-confidence and rigid discipline only widened the gulf of expertise between Fiora and her peers. Her fellow duelists perceived her confidence as arrogance, but none could defeat her in combat, and each victory only heightened her lofty self-esteem. Even so, Fiora never allowed herself to become complacent in her training, and she drove herself ever harder to become a worthy successor to her father's legacy. Her devotion turned out to be misplaced. On the eve of an arranged duel, Fiora's father was caught slipping a slow paralysis poison into his opponent's drink. Following the incident, many of his past opponents came forward with their own accusations: envenomed weapons, bribery, blackmail, and more. In an instant, he had destroyed his family's honorable reputation. Fiora was outraged. Not only had her hero betrayed her ideals, but Demacia's dueling elite now doubted her own ability. She desperately wanted to wipe the stain from her family's history but, even more, she wanted the world to acknowledge her mastery. She found her solution in the one arena where she could fight the world's strongest warriors without being accused of dishonesty: the League of Legends. Hmmmm.... Looks great! Temporary approved!